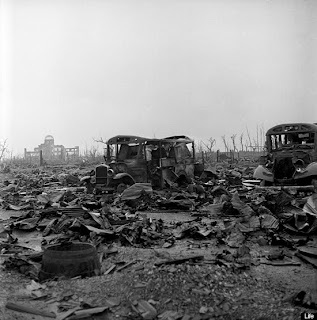 Today is August 6, and back in 1945 we dropped an atomic bomb on Japan. 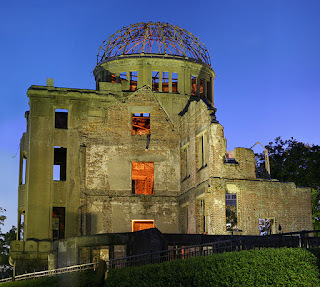 Read this short article at Wired.com http://www.wired.com/thisdayintech/2010/08/0806hiroshima-atomic-bomb and pray that no one ever uses such a weapon again. This is relevant because in the aftermath, researchers claimed that Japanese who ate miso fended off radiation sickness. Same with Chernobyl. With all the CT scans I get (each scan is equal to about 400 x-rays), I'm trying to work more miso into my diet. I've never really been in to homoeopathic cures, but it can't hurt. The image above is the Hiroshima Peace Memorial--the former Shima Hospital that was ground zero of the first A-bomb drop, and the only building to survive the blast. Dr. Kaoru Shima, the hospital's founder, was out of town during the blast, but returned that day to treat survivors. 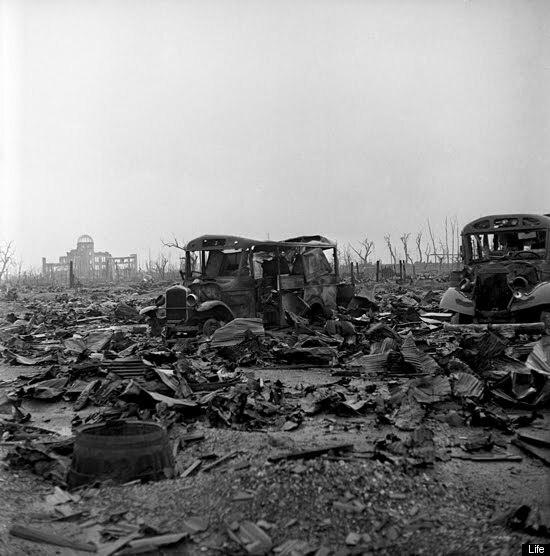 Here's the same building,in the distance, a few days after the bomb.